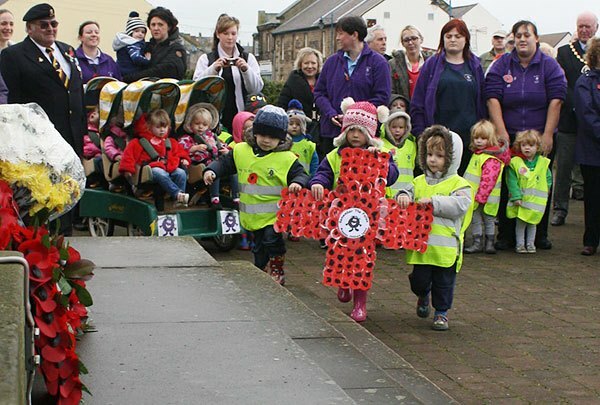 Remembrance Sunday was another proud day for Amble. 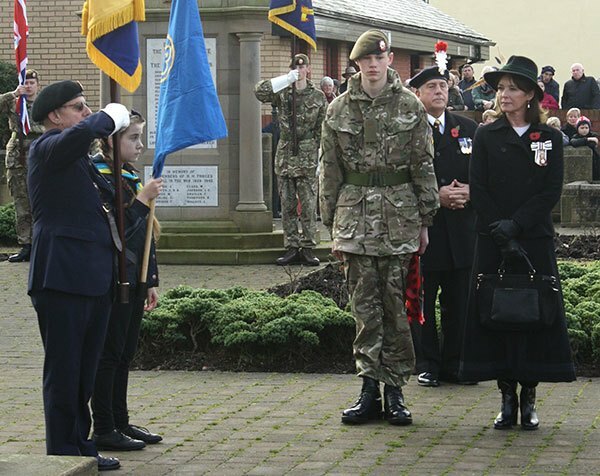 Hundreds of people filled the Town Square to watch Her Grace the Duchess of Northumberland led the tributes to those who gave their lives in war. 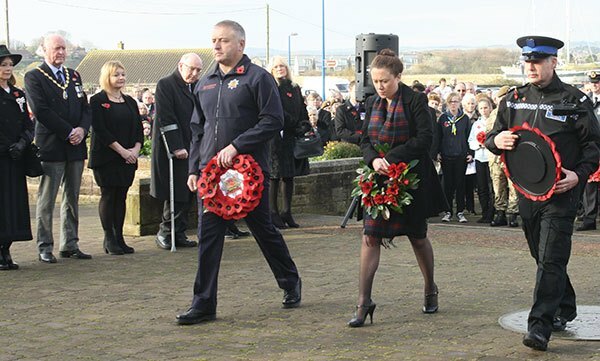 Prayers were led by Rev Diane Westmoreland, Rev Lynda Coulthard and Rev Alison Mills. 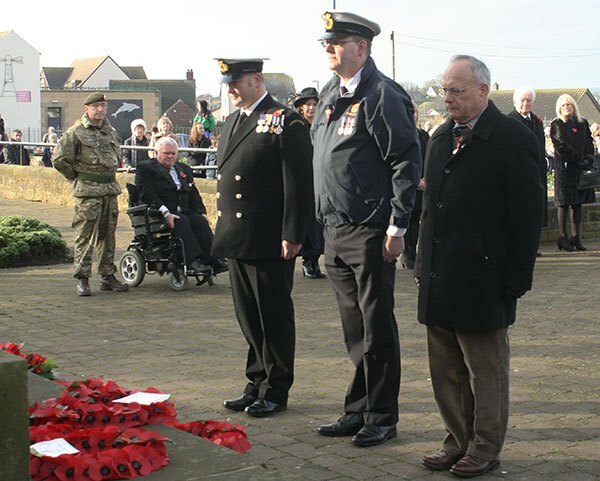 A trumpet sounded the last post as the maroons blasted for the two minute silence. 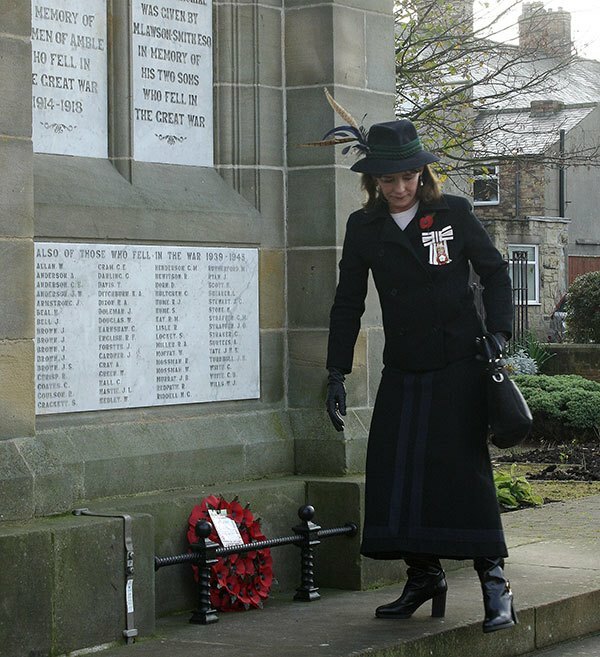 The Duchess, who is Lord Lieutenant of Northumberland, laid a wreath on behalf of HM the Queen. 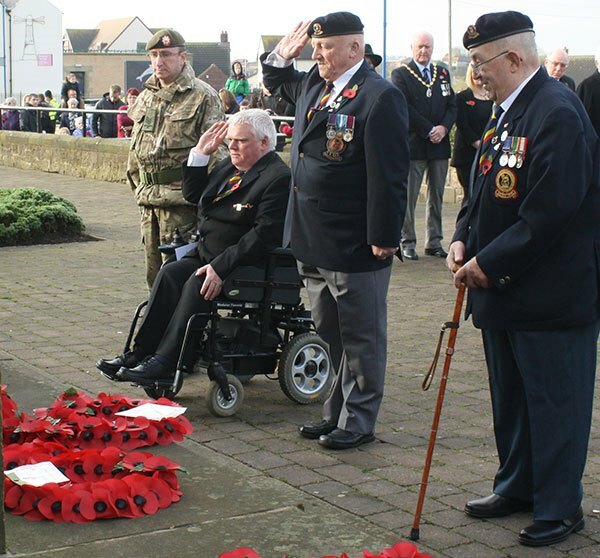 Wreaths were then laid by war veterans and their representatives, by the armed forces, public services and local organisations. 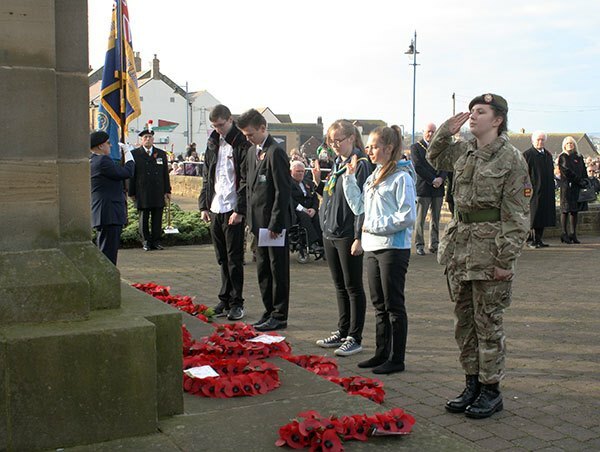 The Mayor laid a wreath on behalf of the people of Amble, and young people from the army cadets, guides and James Calvert Spence College also laid floral tributes. 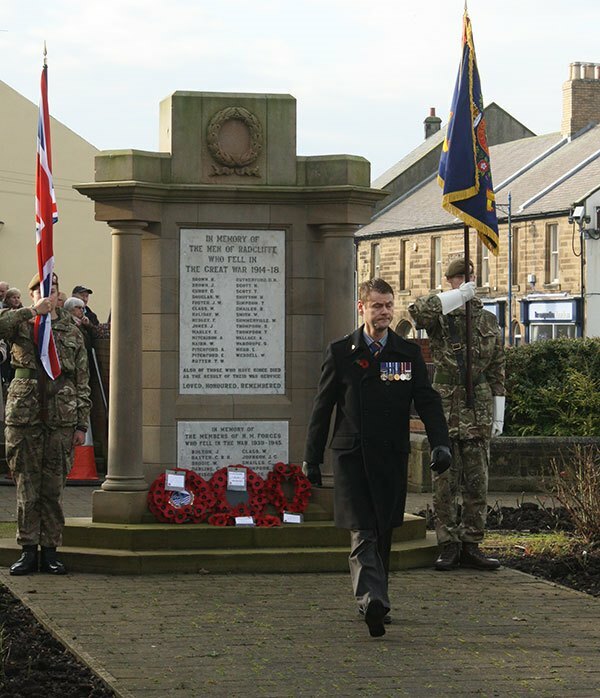 A wreath was laid on behalf of the people of Hauxley and tributes were left at the Radcliffe Memorial which as usual was flanked by two standard bearers. 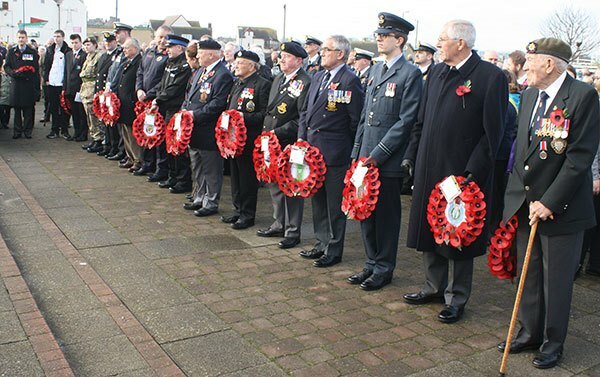 At the end of the service the National Anthem was sung. 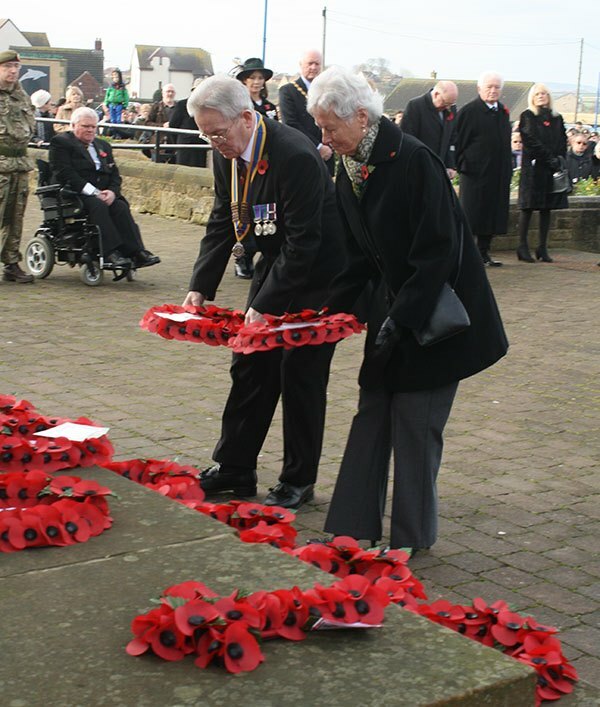 The event was organised by Amble Town Council, who estimated over five hundred people attended on Remembrance Day. 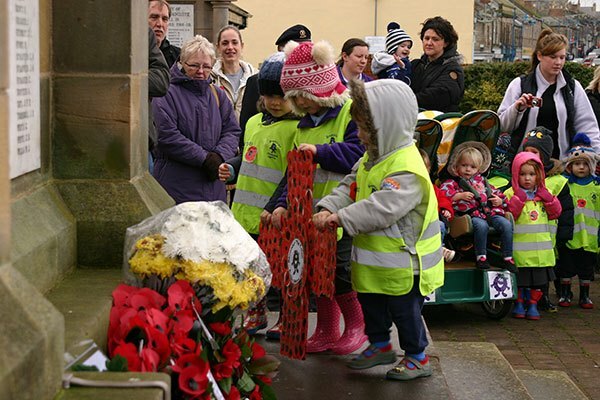 On Tuesday 11th at 11am, children from Edwin Street School and Brambles Nursery held their own memorial service in the Town Square. Prayers were given by Rev Velda Nicholson. 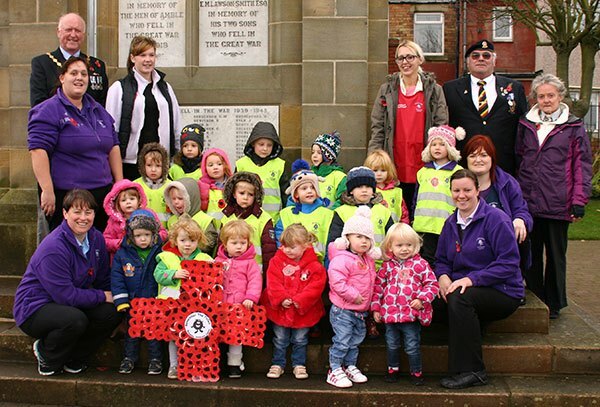 The children who were aged between three and nine years old, all honoured the two minute silence and afterwards laid a wreath and a hand-made poppy cross on the war memorial. 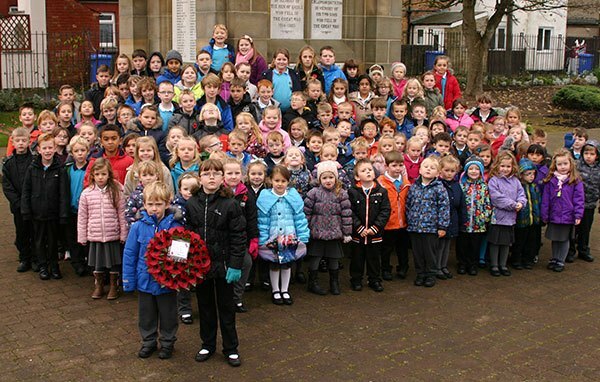 3 thoughts on "Remembrance Day services 2014"
Was such a wonderful day in town square so proud to have been part of it, The children were fantastic . 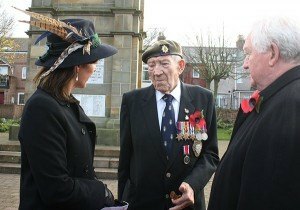 Brambles and Edwin Street you made an old vet very proud of you all. 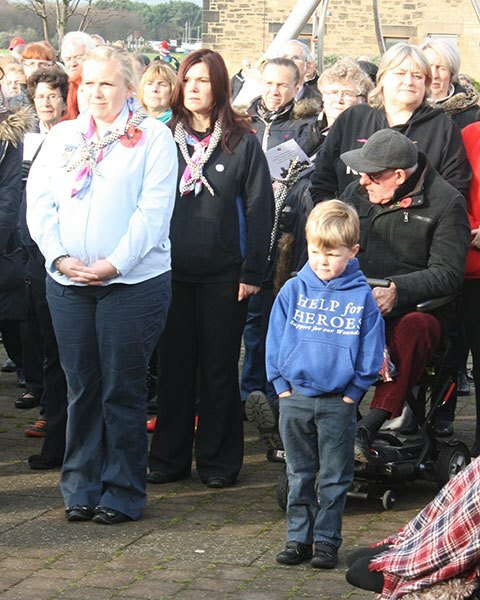 watching the faces while they stood patiently for the rockets then the silence during two minute silence . 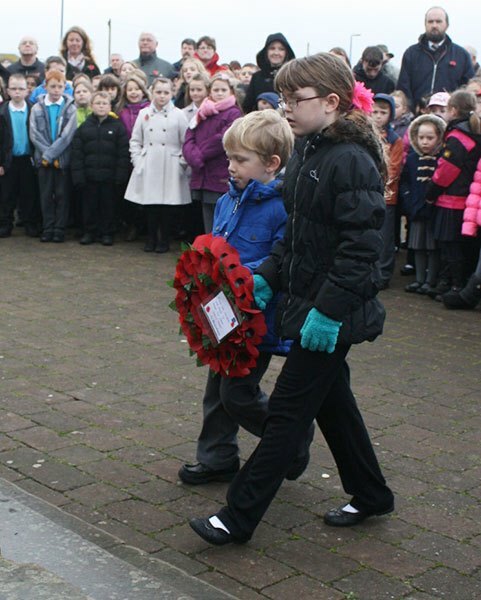 The Children are a credit to their parents and their school teachers great job. Brambles loved being with you little ones magic my farewell salute to you was from the proud heart of an old soldier! 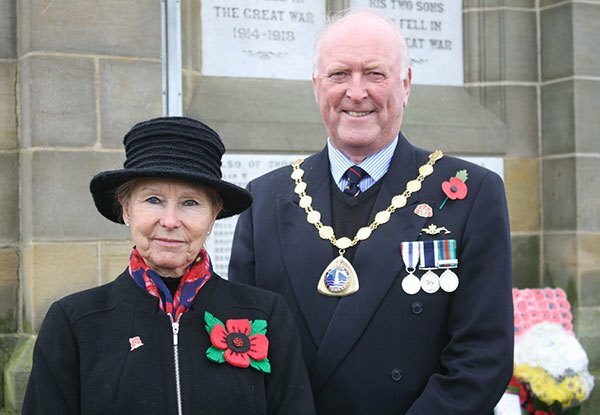 Thanks to Reverend Velda for giving my the honour of quoting the Ode Of Remembrance. a lump and a tear I unashamedly admit to!. My Regimental motto . MEREBIMUR ! “we shall be worthy” you are !every one of you! 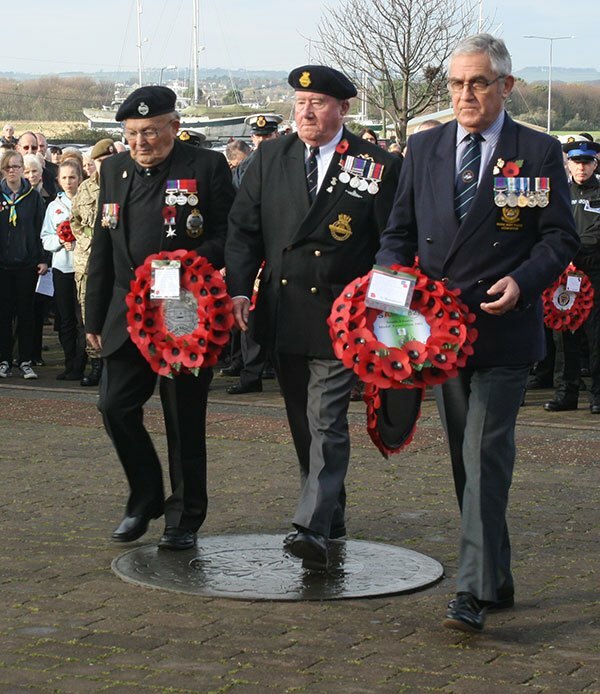 I am in the process of remembering the Amble men who served in WWI on the Imperial War Museum site. 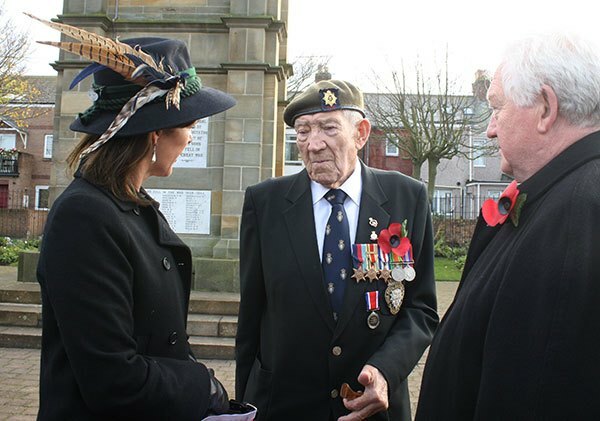 I started with remembering Robert ‘Bob’ Close who served and survived the 4 years of the war. 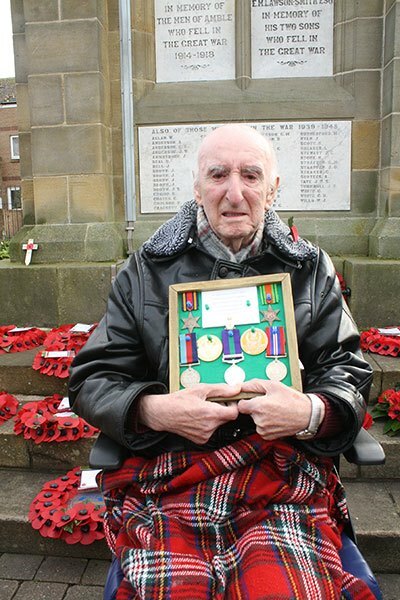 I had the privilege of meeting him in Amble when he was 93 years old. I then decided to remember his pals from the photo-postcards he kept. 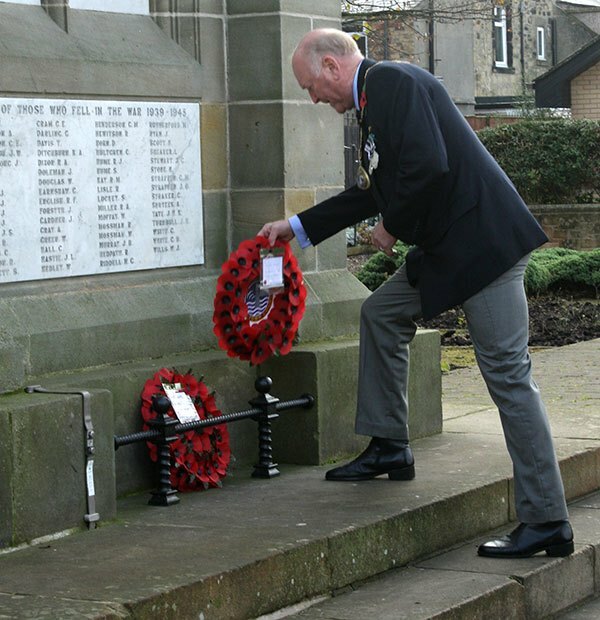 And it grew into remembering all of the Amble men in WWI. 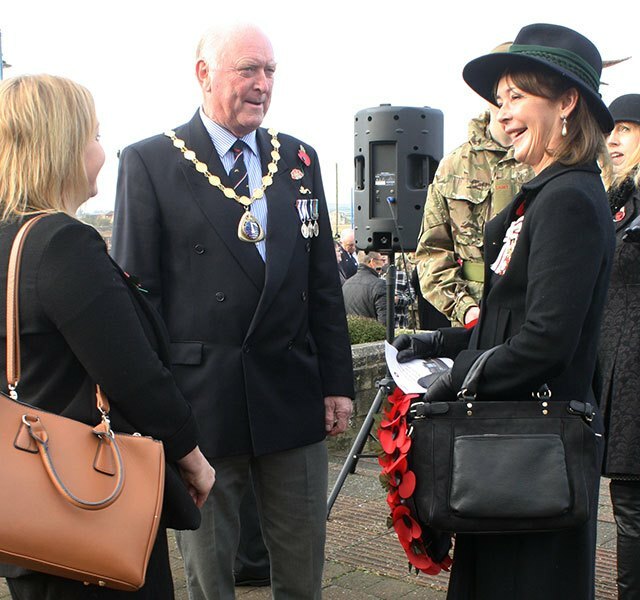 I would like to let as many families/people of the men know about the Imperial War Museum memorial that I am contributing to so that they can contribute any information and photos, etc., they wish to. 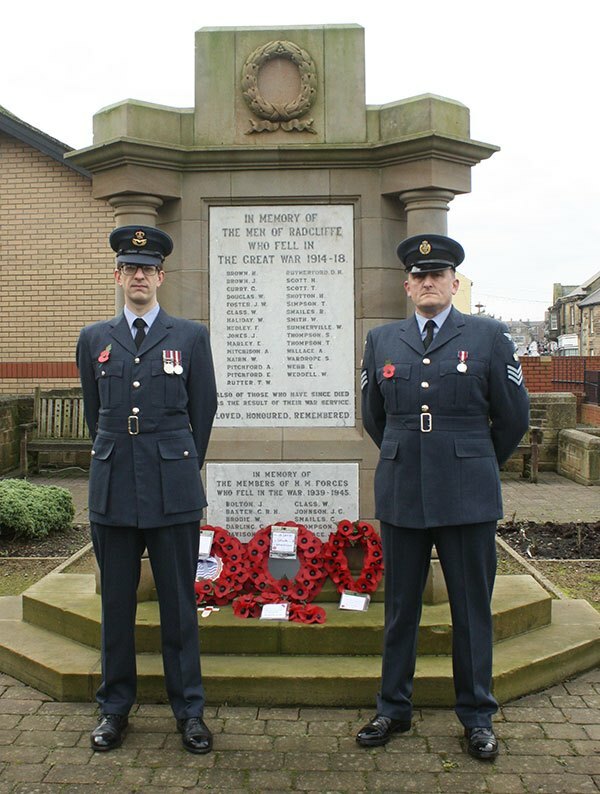 And give the men the memorial and remembrance they deserve. It would be nice to know more about George Skipper’s story. Who knows maybe we are related!